Over the course of this phenomenal series, fans have witnessed the roots and growth of the world\'s greatest superhero. 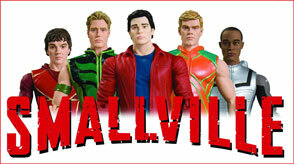 Now, DC Direct presents the birth of the world\'s greatest Superhero team, Smallville style! Grab a moment of the episode entitled JUSTICE, where some of Earth\'s greatest heroes come together for the first time!